Can medical abortion cause infertility? No, medical abortion does not directly cause infertility. No action of the two abortion pills has been reported to have a direct effect on the woman’s ability to be a mom in the future. 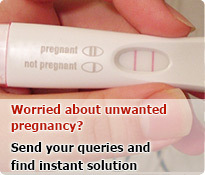 It is a completely safe and non-invasive method of pregnancy termination for a gestation period of up to 10 weeks. It is highly recommended that you strictly follow the dosage regimen and protocols for use to have a positive experience. You must buy abortion pills from a trusted local/online pharmacy with a prescription or from your healthcare expert directly. It is also important to know how the pills work so. 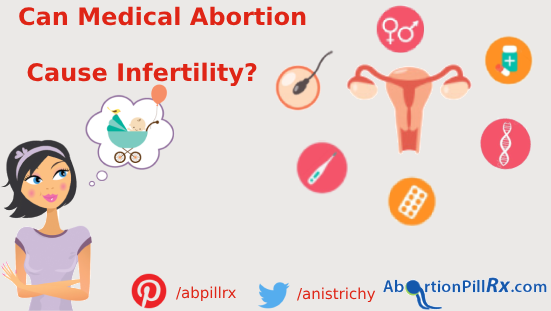 This will help you understand why medical abortion is not linked to infertility. The abortion pill MTP kit (medical termination of pregnancy) contains two chemical abortifacients that act in synergy to bring about an abortion. The first is the Mifepristone drug and the second is Misoprostol. Both the pills work on a hormonal basis. They suppress the actions of the regular female hormones temporarily to end a developing pregnancy. The former works against progesterone which is a hormone that increases and maintains the thickness of the inner uterus wall to nourish the growing embryo and thus sustain the pregnancy. A hampered functioning of it results in the lining being disrupted and the pregnancy contents being separated. The destroyed tissues are not an integral part of the female reproductive system. Their growth is induced by pregnancy. So, it is clear that the actions of Mifepristone are incapable of causing a permanent damage to the female body. The second medical abortion pill, Misoprostol is a prostaglandin analog. It acts on the uterus primed by the former pill to expel the destroyed pregnancy contents. It does so by severing uterine contractions. The drug also acts on the cervix to dilute it so that there an increased ease in the expulsion through the vaginal opening. A complete abortion hence results. All hormones in the body are set back to normal after the active ingredients of the abortion medication are flushed out of the body. So, the regular functioning of the hormonal cycles is not affected either. One must, however, be informed that there are certain circumstances in which medical abortion is advised against. You must undergo a complete checkup to identify those conditions if present and only then take up an abortion. Is medical abortion for me? This may not be a complete list. It is always wise to consult a medical practitioner before making an abortion decision. A failure in obeying the precautions may result in an infection or complication that can then have an impact on your fertility. 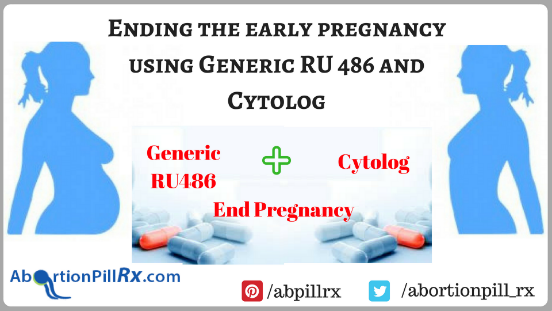 You must also ensure that you consume both the pills in the regimen in the specified amount and within their respective timings to have a positive abortion experience. This entry was posted in Abortion Pills, Pregnancy Termination and tagged buy abortion pills, buy misoprostol online, buy mtp kit online on May 25, 2018 by admin.